Flexibility to adapt to any amp. Your amp choice has a large influence on the sound of any drive pedal connected to it. Riverside’s musical 3-band EQ, with independent Bass, Middle and Treble knobs, is designed to complement your amp’s tone with the flexibility needed to dial in your sound effectively and efficiently. The three-position Presence switch tailors the highest frequencies, allowing Riverside to integrate perfectly with any amp or setup, no matter how dark or bright. Riverside can adapt and integrate with any setup, no matter how dark or bright. It can also be tailored to take your amp where you never knew it could go—letting it shine at any gain level. This audio example demo features a wide range of amplifiers, guitars, and pickup types. 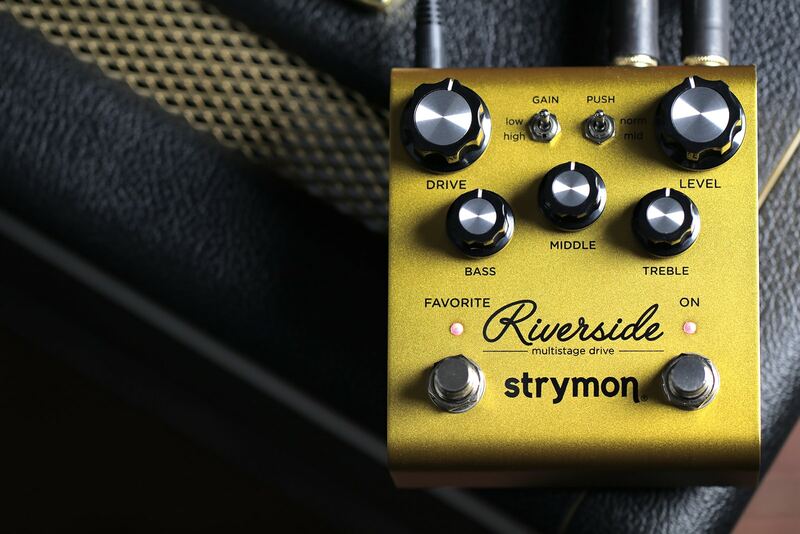 Strymon sound designer and DSP engineer Pete Celi takes you on an in-depth tour of Riverside's sounds and features. Pete talks about the JFET and DSP gain stages, the circuit tuning going on behind the scenes, and goes over the sonic capabilities in detail. Drive adjusts the amount of gain applied to the signal. Employs continuously variable circuit tuning which adjusts many parameters as you turn the knob. Gain toggles between low or high gain channels. Low sets a gain structure allowing for a wide range of low to medium gain sounds. At high Drive settings the sound is heavily overdriven, and slightly 'loose' like a dimed vintage amp. High increases the gain throughout the signal path and tightens things up. Stays relatively clean at low Drive settings, shifting to heavy saturated distortion at maximum. Push toggles between flat or enhanced midrange frequencies. Norm can be used for cleaner, more transparent tones. Mid adds a mid-band EQ push just after the analog front-end gain. This pushes the subsequent drive stages harder, tightening up the response. Perfect for fat drive tones, or pushing a distorted or on-the-edge amp into further breakup. Level controls the output volume level when the effect is engaged. Bass is an active shelving/parametric low frequency control. The control is post-drive, shaping your drive tones before they reach your amp. Middle is a parametric mid boost/cut control with optimized frequency center. The control is post-drive, shaping your drive tones before they reach your amp. Treble is a wide-ranging high frequency active shelf control. The control is post-drive, shaping your drive tones before they reach your amp. Favorite is used to recall a stored favorite preset setting. Red LED indicates that the Favorite preset is selected. Press and hold to save a new favorite sound. On activates electromechanical relay for true bypass. Red LED indicates that the effect is engaged. Presence is a three position switch that tailors the highest frequencies of the output signal. Minus (-) provides clarity with a controlled top end that works well with many amps that have a brighter voice. Enhanced (center) extends the top end to allow for more sizzle on high gain tones. Useful if you want enhanced detail in the uppermost frequencies. Plus (+) delivers extended high end detail to the darkest amps, and is also useful when plugging directly into a power amp. Boost allows use of an external switch to toggle up to +6dB of post boost on/off. 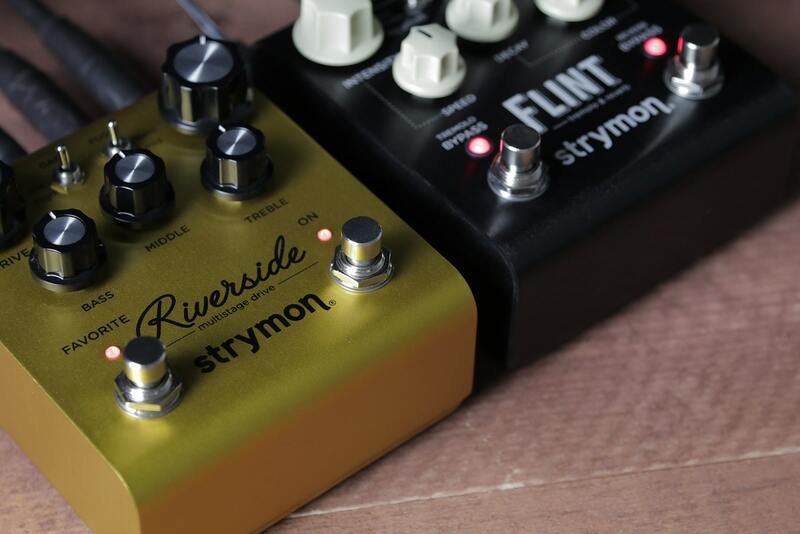 Or connect to the EXP input of another Strymon pedal and simultaneously engage the Favorite settings on both pedals with Riverside's Favorite switch. Boost Level sets up to +6dB of available boost when using an external Boost footswitch. Press and hold ON footswitch to enter Secondary Function mode. Release the footswitch, then turn the desired knob to adjust the parameter. The first stage of Riverside’s custom multistage drive topology is an all-analog, ultra low noise, discrete, class-A JFET circuit. This gain stage is digitally controlled to maximize headroom while adding as much as 20dB of pure analog gain, with tight integration to the subsequent DSP gain stages. With our hybrid approach you get the best of both analog and digital worlds: The JFET stage provides exceptional touch sensitivity and dynamic interaction with your guitar, while the incredibly powerful SHARC DSP facilitates the great level of detailed complexity and responsiveness you’ll want to hear. Riverside allows you to save and recall your favorite settings. Simply dial up your favorite sound, and press and hold the Favorite switch to save these settings. Instantly recall these settings with the press of the Favorite switch, or press again to return back to the current knob settings. It’s like having two drive pedals in one. Riverside gives you a three-position presence switch to tailor the highest frequencies of your output signal. Minus (-) provides clarity with a controlled top end that works well with brighter amps. Enhanced (center) extends the top end to allow for more sizzle on high gain tones. Plus (+) delivers extended high end detail to the darkest amps, and is also useful when plugging directly into a power amp. Riverside has an optional, variable-threshold noise reduction feature to tame hum, buzz, and system noise when you’re not playing. A downward expander with advanced signal detection techniques creates a seamless transition to noise reduced silence with all types of input signal dynamics, including staccato bursts and slowly decaying sustained notes. Chances are, you won’t want to wait for your solo to turn on Riverside. The boost pedal input allows you to leave Riverside on all the time with just the amount of dirt, distortion, and drive you desire, and then boost your overall output signal by up to +6dB when you need to jump up in the mix. Connect an external switch to engage and disengage Riverside’s Boost. Connect an expression pedal, and enjoy a whole new level of instantaneous, continuous control. Set as many knobs as you like for the heel position and toe position of your expression pedal, and all settings will simultaneously morph throughout the full range of the expression pedal. Riverside becomes part of your musical instrument, an extension of your musical voice, an active part of your performance. 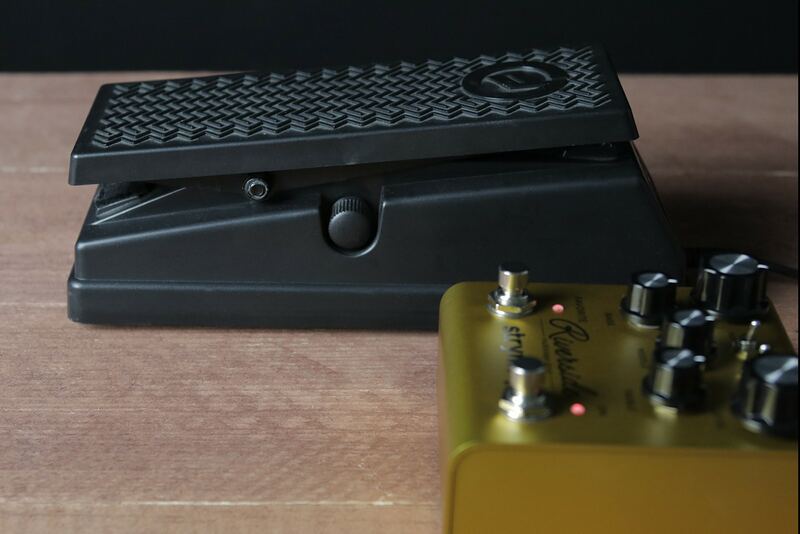 The Expression pedal jack can be set up in Volume Mode, which provides a logarithmic taper for smooth volume control. 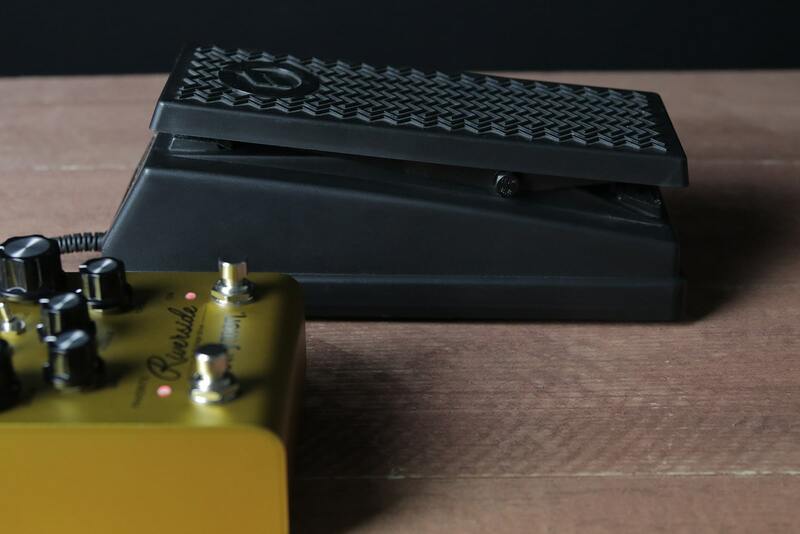 If you have an expression pedal, this provides an excellent alternative to a standalone Volume pedal. Your favorite just got more powerful. 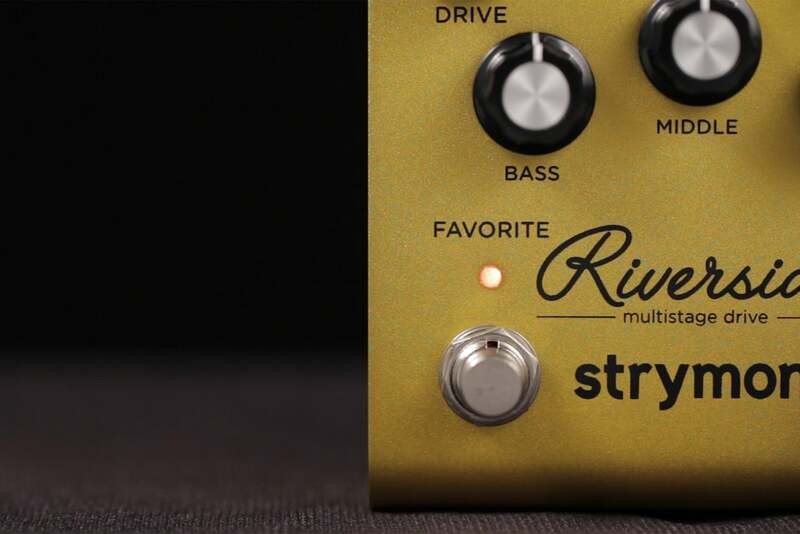 Want to control the Favorite preset settings on multiple Strymon pedals with just one switch? Connect a TRS cable from Riverside’s BOOST jack to the EXP input of another Strymon pedal and simultaneously engage the Favorite settings on both pedals.